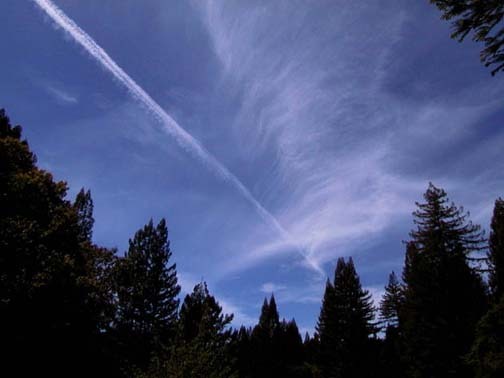 Chemtrails overhead today in Navarro, Mendocino county, CA - a rural coastal area in the redwoods, three hours north of San Francisco. That began about 1:45 pm and more appeared every few minutes. The first chemstails I saw overhead appeared on March 21, 2003. Today began with absolutely clear, blue skies; now the sky is hazy.